It is a known fact that IIFA which was held in the third weekend on June in Thailand was a star studded evening with many Bollywood celebrities attending the event. Amongst them Riteish Deshmukh will be seen hosting one of the segments during the award ceremony. The actor, in fact, decided to don one of the most popular avatars of the year during his hosting stint. Well! The picture doesn’t need any explanation on whose avatar is Ri! Yet, for the ones who have been living under a rock, let us tell you that Riteish Deshmukh has turned Hilji. Who is Hilji? He is the long lost brother of Alauddin Khilji. The popular villainous character of the Mughal king was portrayed by Ranveer Singh in Padmaavat which featured Deepika Padukone and Shahid Kapoor. 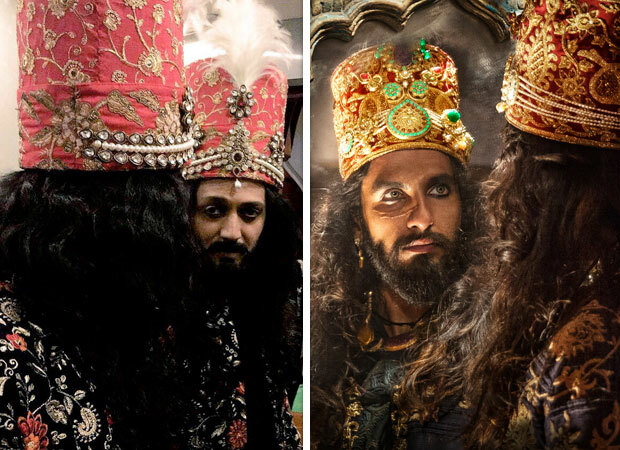 In fact, Riteish Deshmukh also introduced his character on his Instagram page saying, “ear Allauddin Khilji @ranveersingh meet #Hilji #IIFA2018 @colorstv.” We are all aware of the comic timing of Riteish and this time, yet again, we must say we are not disappointed! Riteish Deshmukh, who has also been keenly venturing into Marathi cinema, will be seen hosting along with Karan Johar. The award ceremony, that was held in Bangkok, almost a fortnight ago, will be airing on Colors channel soon. Aditi Rao Hydari and Rajkummar Rao work off the RAO factor as the cover stars for Elle this month!